Play-A-Round™ Golf takes Mini Golf to the next levelThis fully inflated unit is easy to transport and simple to set up. It features 9 holes of varying designs and levels of difficulty. Hole 9 also has a motorized inflatable windmill! 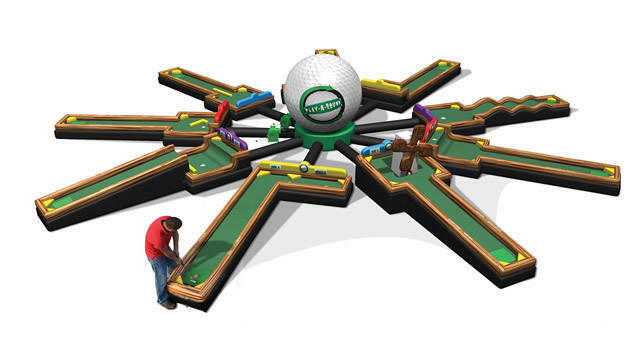 This set includes a modular hub and all 9 holes that can be arranged in any order. Unlike other inflatable mini golf courses, this inflatable is designed for patrons to walk around the putting surface, preventing their movements from disturbing the ball. And since the surface is inflated, simply turning on the blower results in a smooth playing surface.